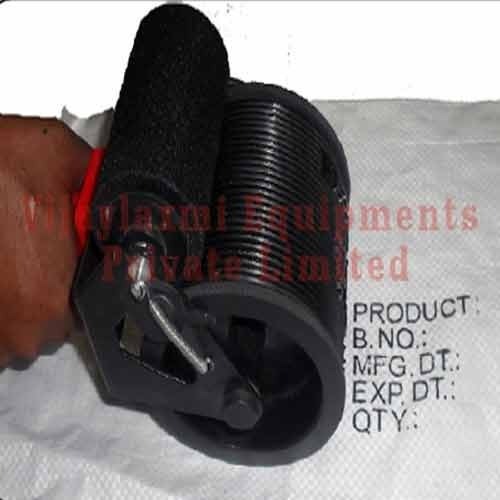 Vilax Non-Porous Handy HDPE Bag Coder is typically used for marking the following information on outer packs; Batch Number, Date of Manufacture, Expiry Date, Name and address of Customer / Manufacturer, Product name or Code. Shipping Instructions, Packing Details, Net Weight/Gross Weight, Price, Invoice Number / Challan Number Statutory Markings. Handy Coder increases the efficiency of your marking department by making it possible to mark HDPE Bags, Drums, Fiber Sheets, Plastic etc. many (5-10) times faster than any other device. It makes hundreds of impressions without Cartridge re-inking. It thus pays for itself within weeks. With about 60 minutes experience, even an unskilled worker can mark upto 30 impressions per minute. Non-Porous Quick Marker is light - weight only 900 gm - operators can use it continuously without any exhaustion. It marks with one uniform motion and the marker returns to its Zero position after each impression. Available Sizes: 2"X6", 3"X12", 4"X14" and 5"X12". Over the years, we have emerged as one of the respective names in the domain of manufacturing, supplying and exporting a comprehensive array of Marking & Coding Systems and Coding Inks. Our range comprises Handy Coder, Manual coder, Table Top Batch Coding Machine, Friction Driven Coding Machine, Manual Operated Batch Printing Machine and Semi Automatic Batch Printing Machine. In addition to this, we also offer the Consumables Like Cartridges, Ink rollers, Rubber Stereos, Rubber Logo, and Letter Sets among others. We make use of finest grade Raw Material like ABS, PVC Powder, stainless steel, brass, copper and aluminum to fabricate our products. These products are widely popular for their sturdy construction and low maintenance. We are proud to have team of expert and experienced personnel, which helps us in carrying our operations smoothly and efficiently. Our company has established a state-of-the-art manufacturing plant, warehouse & packaging unit and other facilities to perform all our critical operations with ease. All of our efforts are intended to develop high quality products that are delivered within best possible time and at cost-effective prices. Our researchers are continuously involved in exploring new ways to improve the quality of our products. With our sheer determination and continuous hard work, we have been able to expand our operations to various parts of the world including some major markets like East Asia, Middle East and South East Asia.